E​verton winger Yannick Bolasie has blamed his long-term knee injury on a change of routine which comes with joining a new club, and not the challenge of Manchester United man Anthony Martial. The former Crystal Palace winger damaged his anterior cruciate ligament after clashing with Martial in a game against Manchester United. 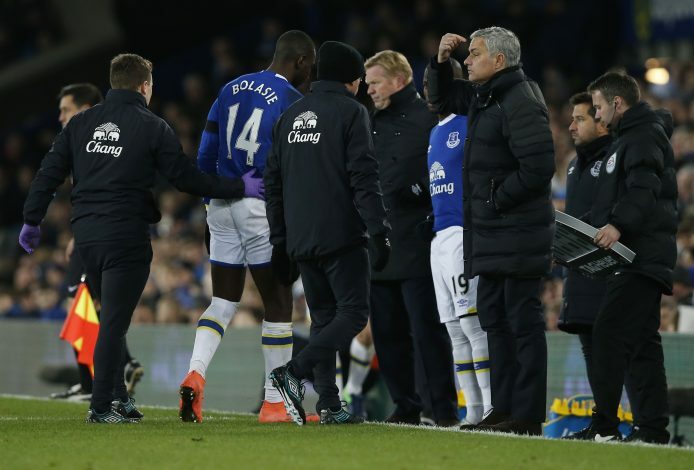 The game ended 1-1, and Bolasie has been sidelined since that game in December. He is currently preparing for a second operation, according to Kicca. The 27-year-old dismissed questions that he blamed Martial for the injury, blaming it on a change in training routine. “No not really, because it’s a thing I do all the time. I’m always stretching and I’m always in contact with someone. “I’m going back to the drawing book and it was something I hadn’t spotted, probably because I wasn’t in my normal routine that I would have liked to have been when you move to a new club. “At Crystal Palace, I had my routine – I was all right, I knew what was going on in my body. But when you move, you start doing different training methods. You don’t realise that other places in your body are getting tight and you still carry on,” he said. The Congolese man switched to Everton from Crystal Palace during the summer for a reported £28million fee. He made 13 Premier League appearances for the Toffees before suffering the injury.